School has never been an arena of ease and confidence for my son, but three years of middle school all but sucked his spirit dry. As a child, Jesse had a tireless, contagious enthusiasm for life and a sparkle in his eyes that could blind you. As a teenager, his natural exuberance faded to surliness, his charm replaced by sarcasm. I watched helplessly as friendships he made faltered and fell, as his grades sunk lower with each term, as his hair changed from bowl-clipped brown to bleached buzz to spiky green to blue to pink to black. By spring of his eighth-grade year, he was sullen, apathetic and self-loathing. He claimed to hate school and almost everyone in it. Even on the warmest days, he wouldn’t leave the house without a black hooded sweatshirt. When I picked him up after school, I watched him float through the boisterous crowds shrouded like the Grim Reaper, eyes forward and down. A grunt was my only greeting when he slid low into the front seat. “Just go!” he’d snap if I tried to initiate a conversation. My partner, Kate, and I had met with the school staff and teachers repeatedly. I e-mailed Jesse’s teachers weekly about his assignments. We tried rewards. Threats. Counseling. Sat at his side while he did homework. Still, both his grades and his attitude scuffed bottom. With only two months left of school, I was ready to throw in the towel and home school him. 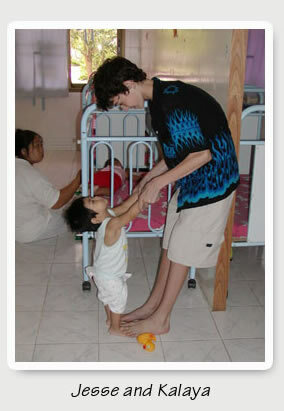 Then I came across an opportunity posted on a local website: Volunteer in an Orphanage in Thailand. The idea seemed ridiculously impossible, but something about it grabbed me. When I mentioned it at dinner, half joking, both Jesse and Kate responded excitedly. Kate has always believed that the cure for a bad adolescence is an introduction to third-world disadvantage. 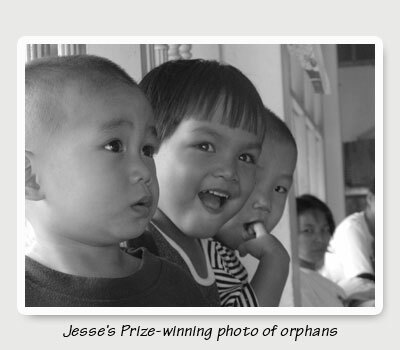 And Jesse was thrilled at both the chance to travel and the idea of working with orphans. Every day after school he harangued me: “Have you called about that orphanage yet?” and I saw a sparkle reappear in his eyes. Timing was crucial. It was only a matter of months before this fog of sullenness would become a wall of hostility and Jesse would balk at the idea of traveling anywhere with his parents. I’m not ordinarily a spontaneous person, but something about this opportunity drew all three of us like a siren singing on a misty sea. Before I even knew what was happening, everything fell together. Within two weeks we had made arrangements with the orphanage’s local contact, I had scheduled a paid month-long leave I was due from work, Kate had arranged an unpaid leave from her job, I’d found shockingly cheap airfare on the Internet, and we’d gotten an enthusiastic blessing from Jesse’s principal and teachers. Within two more weeks, we were on a flight to Thailand. It was after midnight when we arrived at our hotel in Bangkok, but the streets were alive with neon lights and crowds of easy-going people, both locals and travelers, who eyed us with genial curiosity. The warm, heavy air pressed against my winter-timid skin with a startling intimacy. 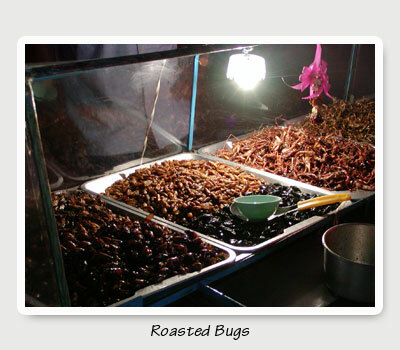 Pungent aromas drew us to a line of food carts, but when we saw one cart of pleasingly displayed heaps of roasted insects – cockroaches, beetles, crickets, maggots and more ― we opted for spring rolls at a nearby restaurant instead. The next morning we met our orphanage guide, Jake, who took us around Bangkok. 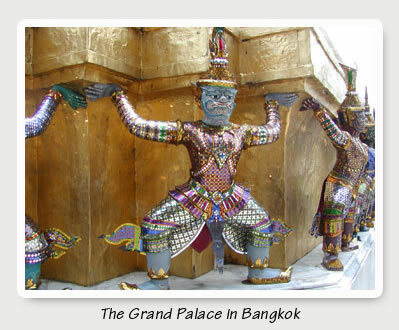 We went to the Grand Palace, where we stumbled heads back, mouths open, ogling searing golden spires, sparkling mosaic statues, elaborate murals, and intricate roof designs. We shopped in a street market and ate pad Thai at a sidewalk cafe. We took a ferryboat with a group of saffron-sheathed monks, and rode in Tuk-Tuks, the three-wheeled motor carts used to maneuver tourists through traffic. Back in our rooms, the sudden afternoon rain poured in sheets off the roof. 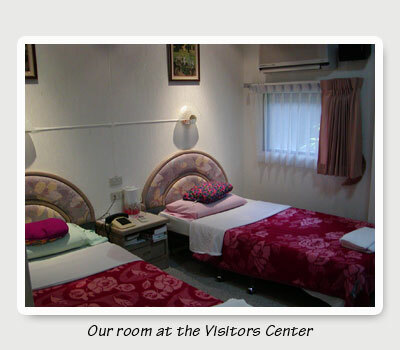 The following day, we took a two-hour bus ride to Pattaya, where we found accommodations waiting for us. The Redemptorists Center is a pastoral oasis in the midst of a choking city, guarded by a toothless gatekeeper operating a hand-cranked gate. Fan-shaped palms, orchid gardens, Koi ponds, and fountains nest the administration buildings and the Retreat Center, where we stayed. Our rooms were small, clean, and functional with a pristine spareness that reflected both the abstention of Catholicism and the simplicity of Buddhism. Even so, by Thailand standards, they were luxurious. Each room had an air conditioner, a phone, a tiny refrigerator, a hand-held showerhead next to the toilet, and – to Jesse’s great approval – a portable TV with cable. We ate that night in the dining room where we would have all our meals at the Center, filling our plates with stir fry and rice, salad and exotic fruit. On the tables were pitchers of cold water and, for napkins, rolls of toilet paper housed in crocheted covers. We sat with a group of people from Australia, Korea, and Zimbabwe who were preparing for a conference at the Center on Theology and Global Health. Later that week, we would watch the Center swell with 80 more people from all over the world, each glowing with credentials and inner vision. 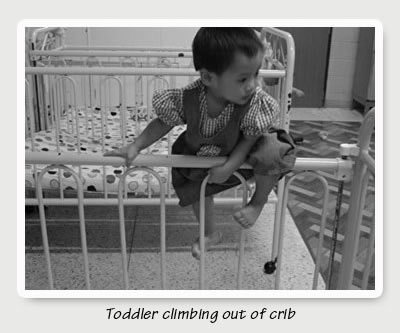 In the morning, Jake took us to the orphanage – a fifteen-minute walk from the Center. We left our shoes on a shelf at the gate and entered a covered porch where two- and three-year-olds played. They swarmed us immediately, clutching legs, reaching up, charging at us in plastic vehicles. But Jesse was the one who really caught their attention. 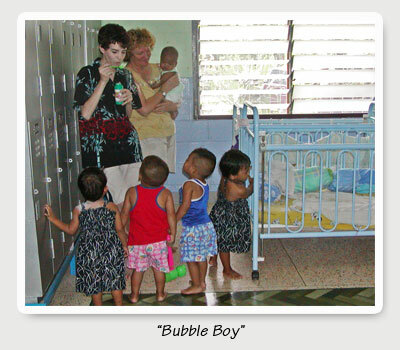 Foreigners are a common sight at the orphanage. But a skinny, pale 14-year-old boy with braces on his teeth is a real oddity. They circled round him warily, eyed him as if he might be some sort of hybrid between them and us. Then the ringleader, a fiery-eyed little girl named Duangjai, stepped forward and, with a mischievous grin that filled her whole face, slapped hard at Jesse’s bare leg. She stepped back and waited to see what he would do. Jesse looked at me, perplexed for a moment, then looked back at the little girl, tilted his head, raised one eyebrow, and let out growl and yip-yap that sounded exactly like a ferocious Chihuahua. The shrieks were deafening as the children scattered like startled fruit flies. Then they regrouped and charged at him with playful vengeance. They pounded his legs and backside, pulled at his arms, anything to elicit more barking. Kate came to the rescue with a bottle of bubbles we’d brought with us. Jesse was able to keep the children at bay by redirecting their furor at the bubbles until we could all slip through the door into the Baby Room. 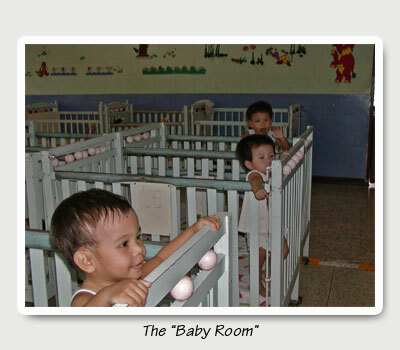 The Baby Room is a large room filled with 30 cribs, housing infants as small as three-pound premies and toddlers up to 24 months. The littlest ones doubled up, cordoned by rolled blankets. Older ones wandered the room, on knees or bare feet, sometimes clutching a coveted toy. Many slept. Many peered over the bars of their crib, scanning the room for willing arms. Many cried. That was it? No introduction to someone in charge? No communication with other staff? No rules or expectations? Not even any guidelines for when to pick up a child or how to intervene in baby squabbles? In America, you would never presume so much leeway over someone else’s charge. You wouldn’t even offer a child candy without first checking with her parent. But here, even the most obvious rules, like don’t wake a sleeping baby or don’t give hard candy to a toddler, did not appear to be in place. Timidly, I approached a crying toddler and held out my hands, half expecting rejection. But the child immediately stopped his crying and nearly leapt into my arms, wrapping limbs around me monkey-style. I forced myself to ignore the smear of snot and tears on my shoulder and molded my arms around his perfect brown-skinned body. I looked around the room and saw Kate beaming, a baby in each arm. Jesse was playing peek-a-boo through crib bars. When the baby reached to be held, Jesse stepped back. “Go ahead. Pick him up,” I urged. But Jesse shook his head with a guarded look. He preferred, that first day, to keep some distance and spent most of our morning there playing tag with a little girl in a walker. It was only when a nurse put the walker away and set her on the floor that we realized the girl had cerebral palsy and couldn’t walk, crawl, or even sit on her own. She lay on her back and scooted herself headfirst until she smashed her skull into an obstacle. Jesse tried to steer her clear of crib legs, but frustrated and angry, she threw herself into temper tantrum that no one could console. The nurses finally let her be, stepping around her flailing body. I watched Jesse watching her – feet kicking, nose streaming, voice hoarse from rage – and I thought of the tantrums Jesse had for years. How after he’d gone over the top, there was nothing I could do but wait it out. How attempts at reasoning backfired, and even the gentlest touch would be flung back in our faces. Kate and I would sit on the floor, as near as he would allow and wait for that breaking point, when fury crumbled to sorrow and our arms were a welcome refuge once again. Jesse eased himself cautiously to the floor near the girl and wrapped his arms around his knees. Resting his cheek on a knee, he watched her intently, his face a screen of sympathy and calm. After awhile, her cries changed to hoarse wheezing and she twisted her head around to look at Jesse. “Hi,” he whispered. She lay quiet at last, her eyes transfixed on him, until a baby nurse reached down and scooped her up. We were hooked. We walked to the orphanage every morning after breakfast and stayed until lunch. The toddlers on the porch greeted us with wild enthusiasm each day, the girls clamoring over Jesse like groupies to a rock star. He tolerated it with patience and humor, but was always relieved to escape to the Baby Room where the charges were less aggressive with their affection. Jesse grew more comfortable holding the babies, as long as he didn’t have to change them, and he was great at feeding bottles to the little ones. He took on the job of Official Bubble Blower, both for the babies and the toddlers on the porch, who scaled the barred windows like monkeys, shrieking at the sight of him, begging for more. But his favorite time was spent with Kalaya, the girl with cerebral palsy. Propped against him, she could sit up and view the action around her contentedly. With his support, she could stand on flexed toes and even take some steps. He watched a physical therapist work with her one morning, stretching her leg muscles and bending her knees, and he did the same with her. He began to see a change in the length of time she could stand without crumpling and he was convinced that with enough time, he could teach her to walk. Kate and I had our own favorites we were falling for. Mine was a girl about nine months old, Suleelat, who had arrived the first week we were there. She cried inconsolably for hours and, like Kalaya, was left to her own misery when the nurses could not find a way to console her. I’d strapped her to my chest that first day, in a baby pouch we’d brought, and carried her all morning, even as I changed diapers and fed bottles. We were bonded from then on. Kate loved them all. She moved through the Baby Room with the confidence and grace of a doting mâitre d’: checking diapers, propping bottles, wiping noses, changing crib sheets. She loved getting there early enough to feed the toddlers breakfast, which involved squatting on the floor and spooning porridge from a large mixing bowl into the open mouths gathered around her. She couldn’t stand to hear one crying baby, and could soothe even the most fervent bawlers. When there were numbers of them, she’d settle herself on a floor mat and adorn herself with the bundles we brought her, feeding one, rocking another, making faces at a third: one big happy heap of babies. The baby nurses, who eyed us warily or ignored us completely at first, now greeted us with circumspect affability. They repeated for us the babies’ names, which we tried to master but always mispronounced. They showed us through gestures how to prop bottles or massage a gassy stomach. And they tried not to laugh at our inept diapering (we never could master the one-pin technique that is standard there). Each day we trudged “home” through the midday heat, exhausted and emotionally dazed, grateful for the lunch that awaited us. Our afternoons were our own. We usually rested after lunch, greedily soaking up the air conditioning, waiting out the torrential thunderstorms that seemed to arrive and depart like clockwork. Then we might explore parts of Pattaya. We could walk fifteen minutes to a busy street where we could catch a “songtao” – a small pickup truck with covered benches in the back – and ride to the tourist area by the beach.. There Kate could get a Starbucks fix, I could e-mail friends at an internet café, and Jesse could scour the street vendors for the best prices on souvenirs. We explored the area in short forays. We went to a botanical gardens and zoo, visited Buddhist temples, drove go-carts on a racetrack, and fed fruit to wild monkeys. One weekend, we took a boat to a nearby island where the beaches are not polluted and rented a hut for the night. Kate and I lounged in beach chairs under the palms and watched Jesse leaping, gleeful, through bath-warm waves. The adventures balanced out our time at the orphanage, which remained our primary focus. 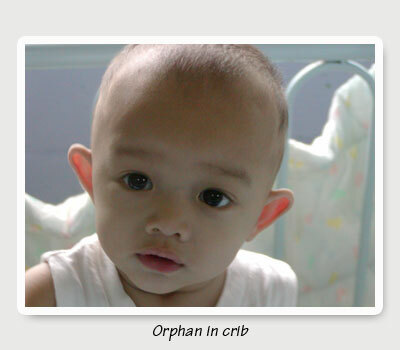 We grew more attached each day to the radiance that dawned on the orphans’ faces when they laid eyes on us. We had originally planned to spend the last week of our month traveling in Northern Thailand. Jesse had researched treks on the Internet before we left and was set on a tour that took us by foot, elephant, and bamboo raft through the jungle. But when it came time to make arrangements, he changed his mind. He didn’t want to leave the orphanage. None of us did. With one precious week left and all of Thailand to explore, we found ourselves clinging to what was feeling more and more like home to us. After three weeks, we were finally starting to acclimate. We had memorized each landmark on the nearby roads. Knew which dogs would stop barking when we hissed at them and which ones to move to the opposite side of the street to avoid. Knew when to hold our noses to avoid the overpowering stench of durian, a large, ugly fruit sliced with machetes and sold from truck beds. Knew the name of the woman who sold us sodas and Imodium from the tiny roadside drug store, who was so proud to know some English and was ecstatic when we told her how much the $100 bill her sister in New York had sent her was actually worth. (“Only one…” she had said sadly when she showed us.) I had finally mastered a few basic Thai words whose tonal subtleties were so hard to grasp. We could make our way around the city with confidence and had discovered wonderful restaurants to alleviate the monotony of the Center’s buffets. And the Center staff and baby nurses were treating us less like foreigners and more like distant family. We were growing to love this place. There is in Thailand a pervasive feeling of acceptance. On the most tangible level, it’s seen in the openness of sexual trade, which is less seedy than in America and not stigmatized with shame. And in tolerance proffered to gays and transvestites. “Lady-men” walk freely around the town, and it’s not uncommon to see a soft-spoken man in heavy makeup behind the counter at Burger King, for example. But on a deeper level, that I as a foreigner and non-Buddhist can only begin to recognize, there is this underlying sense of serenity, a welcoming of life that is simply absent from our culture. You see it in the way people meet your eyes when you walk down the street. Non-procuring, non-ingratiating, non-judgmental. Just a simple, curious openness. A willingness to, for one short moment, share a glimpse of souls. 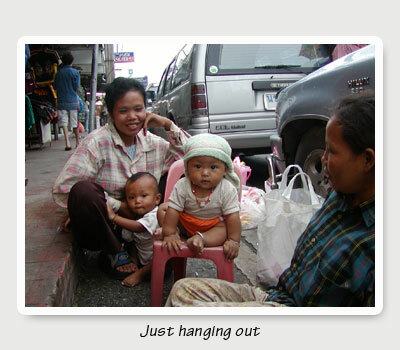 I felt all of us change in Thailand, as our pace slowed and we began to live for the moment and not for the dream. But in Jesse I watched a metamorphosis. For four weeks, there were no peers to impress or to hide from, no friendships to vie for, no insults to dodge, no homework to fight over. I watched his soul reappear, unhindered by defense, and it is one of the most kindhearted souls I’ve seen. 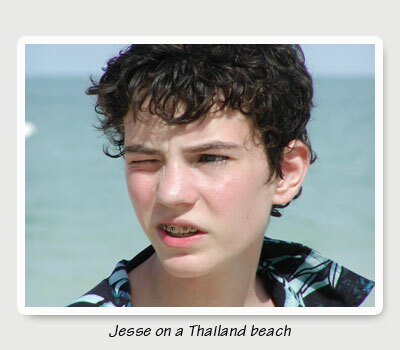 In fact, I think, more than anything, our time in Thailand gave Jesse permission to be kind. In a culture where gentleness is a given, in a setting where compassion is immediately reinforced, he didn’t need the armor he had constructed around himself, layer upon layer over the years. Our last days at the orphanage were wrenching. Jesse begged to extend our stay, but we had jobs and bills waiting for us back home. Had we come even close to meeting the strict criteria enforced for adoption, it would have been hard not to call dibs on at least one. 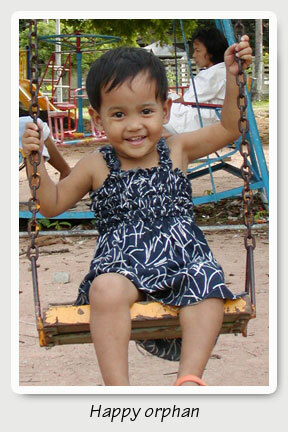 We settled instead on sponsoring my favorite, Suleelat, the little one I carried next to my heart on her first day. And Jesse volunteered to donate half of his weekly allowance to sponsor his two favorites: Kalaya, the girl with cerebral palsy, and Duangjai, the toddler who whacked him that first day and fiercely lay claim to him every day afterward. We arrived home in time for the last two weeks of school. I was sorry to see the sweatshirt hood conceal the wild mop of dark curly hair that had finally been allowed to grow naturally. But when I attended the slide show presentation Jesse gave as part of his arrangement for passing grades, I noticed he pushed it off his head when he started to talk – describing the distinct personalities of the orphans he had photographed, recalling the neon-lit nightlife and the girls who called him “handsome boy,” imitating the sound of the bullfrogs that reverberated every night and the din of starlings in the trees at sunset, and explaining the way the barefoot monks are revered with offerings of food and water as they walk the streets at dawn. There was, of course, a certain cool bravado that tempered his enthusiasm. Still, his face glowed with a calm he had brought home with him, and when the lights came on, he responded to his classmates’ eager questions with a swelling confidence, eye to eye. There is a kind of endorphin, I think, that is released when you give your heart to others, and it is as addictive as that felt by runners. I doubt scientists could measure it, but it’s there all the same. And I crave it like chocolate. I want to go back. We all want to go back. And I’m sure, somehow, we will find a way, because if there’s anything I learned from this, it’s that for every fork you encounter in your path, there are a hundred branches you never even see.